Compliance doesn’t have to be a scary word, even when facing the multifaceted challenges of the European Union’s General Data Protection Regulation. In fact, following through with plans for sustainable GDPR compliance can have many long-term benefits for your organization. That's because relying on data-driven decisions across the board sets you on track to gain a competitive edge. 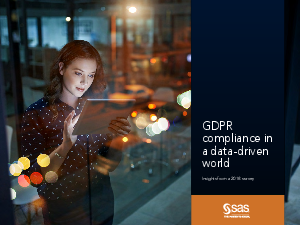 In February 2018, SAS conducted a survey with 183 global, cross-industry businesspeople involved with GDPR at their organizations. Based on the survey results, this e-book delves into the biggest challenges and opportunities organizations have faced on the road to GDPR compliance. Read on for advice from industry experts about the best path to compliance. Learn what steps your peers across a variety of industries have already taken and discover how an integrated approach from SAS can continue to guide your journey toward GDPR compliance.